Thousands of public sector workers have begun receiving grim news about their jobs in the run up to Christmas. The GMB union says "at risk" warning letters are hitting doormats around the UK as councils and other services serve legal notice of cuts. It says workers face a miserable Christmas, with 87,374 posts under threat so far at 107 UK councils. Local Government Minister Grant Shapps accused trade unions of "ramping up" stories of job cuts for political gain. Nearly all local authorities have until 31 March to start making savings and by law have to give staff 90 days' notice. 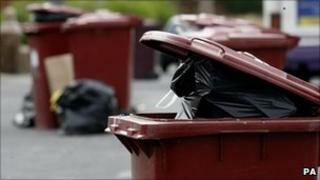 The redundancies follow hefty cuts to councils' budgets as a result of the government's austerity measures. GMB national secretary Brian Strutton said: "Every job lost is a personal tragedy and often a family left despairing for their future. "What sort of Christmas is it going to be for the council workers under notice of redundancy?" He said union officers were consulting members on what to do in this "unprecedented situation". "I received an email about being at risk of redundancy in October. I should find out where I stand in January. "I'm fearful. At 56, I don't know where I would stand, looking at the current job climate and my age. If I was younger I might not be so fearful, but I have about 11 years left before retiring. "It's a very unsettling time. If I lost my job my husband and I would have to consider selling the house and downsizing. "I manage 10 people. Everybody in my team got the email, as well as people who work alongside me and above me. "There are 450 administrative workers and 150 jobs will go. We look after a team of more than 1,000 social workers so that they can go out and look after children. Without us they would spend more time in the office doing paperwork." Social workers, school dinner ladies, meals on wheels providers, refuse collectors, youth workers, and home helps are among those under threat, the union says. A GMB spokesman told the BBC some councils - such as Northamptonshire County Council - had deliberately delayed sending out letters until after Christmas. The final, legal deadline to formally announce job cuts is 1 January 2011. The coalition hopes private sector job creation will offset an estimated 330,000 public sector redundancies over the next four years. Local Government Minister Grant Shapps said: "Employers are legally required to issue such notices when they restructure. But changes to terms and conditions, and the restructuring of job posts, are not the same as issuing P45s. "Every employer, whether in the private or public sector, needs to approach restructuring with care, and recognise the need to show and treat staff with respect. "But the trade unions aren't helping this process by intentionally ramping up stories of job cuts for political gain." The Local Government Employers, a body which works with local councils on pension and employment issues, said councils had been put in a difficult position. A spokesman said: "These cuts are effective from 1 April, and as there is a statutory obligation to consult on any redundancies over a 90-day period, councils are left with no choice but to start making tough decisions now. "No council cuts jobs lightly, but many are being left with no choice. Some jobs will go in natural wastage, not filling vacancies and voluntary redundancy. "However, we cannot escape the fact that some losses will be dedicated professional posts that, given a choice, councils would not want to see go." Earlier this month the latest jobless figures for the UK showed a 35,000 increase to 2.5 million in the three months to October. The surprise increase, revealed by the Office for National Statistics, was driven almost entirely by public sector job losses - pushing the unemployment rate up to 7.9%.